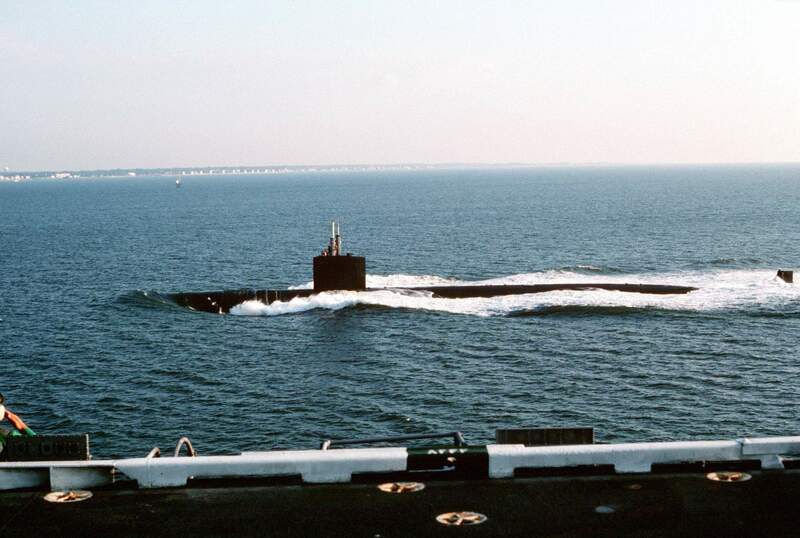 Los Angeles Class Attack Submarine: Laid down, 28 March 1985, at the Electric Boat Division of General Dynamics, Groton, CT.; Launched, 28 June 1986; Commissioned, USS Helena (SSN-725), 11 July 1987. 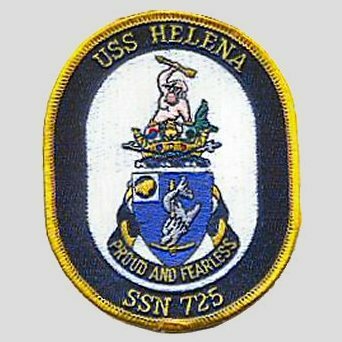 Helena is assigned to the US Pacific Fleet and is homeported at San Diego, CA. Specifications: Displacement, Surfaced: 6,000 t., Submerged: 6.927 t.; Length 360'; Beam 33'; Draft 29'; Speed, Surfaced 25 kts, Submerged 30+ kts; Depth limit 950'; Complement 129; Armament, four 21" torpedo tubes aft of bow, Harpoon and Tomahawk ASM/LAM missiles from 12 VLS tubes, MK-48 torpedoes; Combat Systems, AN/BPS-5 surface search radar, AN/BPS-15 A/16 navigation and fire control radar, TB-16D passive towed sonar arrays, TB-23 passive "thin line" towed array, AN/BQG-5D wide aperture flank array, AN/BQQ-5D/E low frequency spherical sonar array, AN/BQS-15 close range active sonar (for ice detection); MIDAS Mine and Ice Detection Avoidance System, SADS-TG active detection sonar, Type 2 attack periscope (port), Type 18 search periscope (starboard), AN/BSY-1 (primary computer); UYK-7; UYK-43; UYK-44, WLR-9 Acoustic Intercept Receiver, ESM; Propulsion System, S6G nuclear reactor one propeller at 35,000 shp. 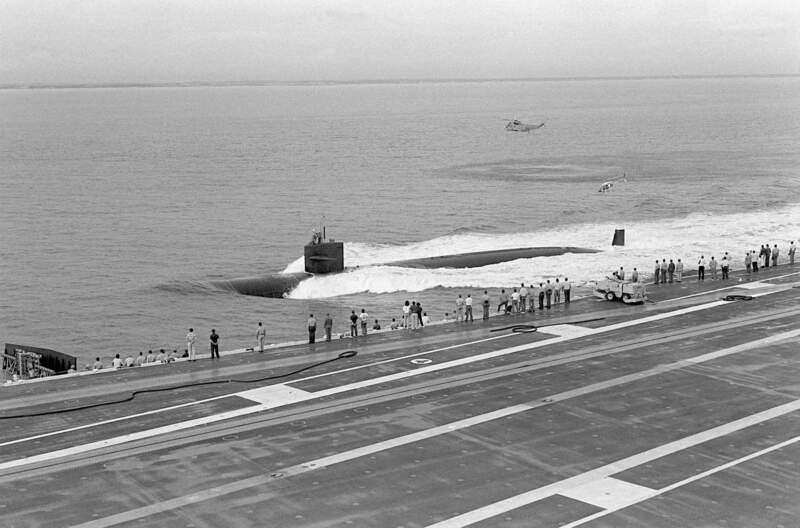 97k The crew of the Helena (SSN-725) line her deck as she slides down the launching ways, 28 June 1986 at the Electric Boat Division of General Dynamics, Groton, CT. Courtesy of Electric Boat. 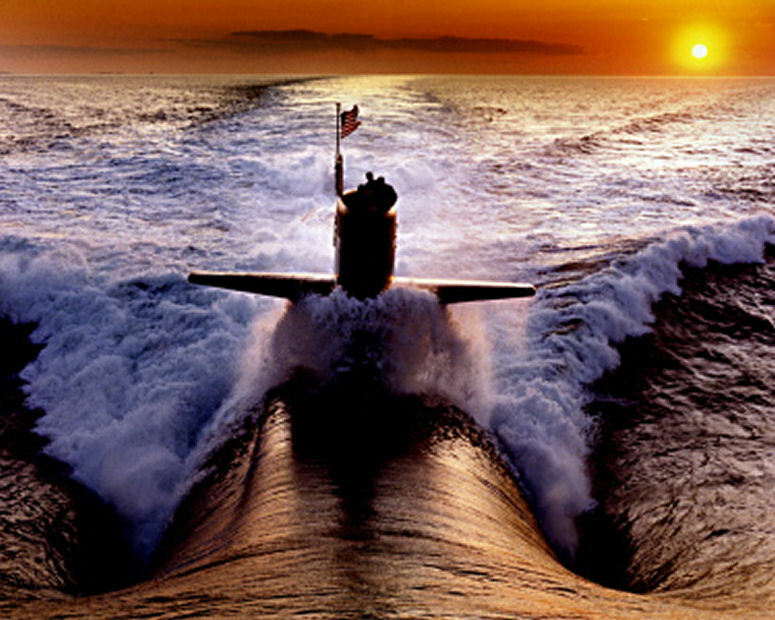 109k Bow on view of the Helena (SSN-725), during her shake down period off the New England coast, circa 1987. Courtesy of Electric Boat. 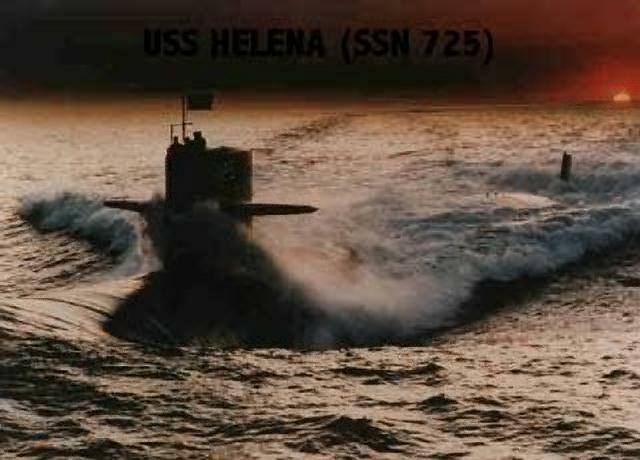 41k The Helena (SSN-725) , probably taken during her shake down period off the New England coast, circa 1987. Courtesy of tripod.com. 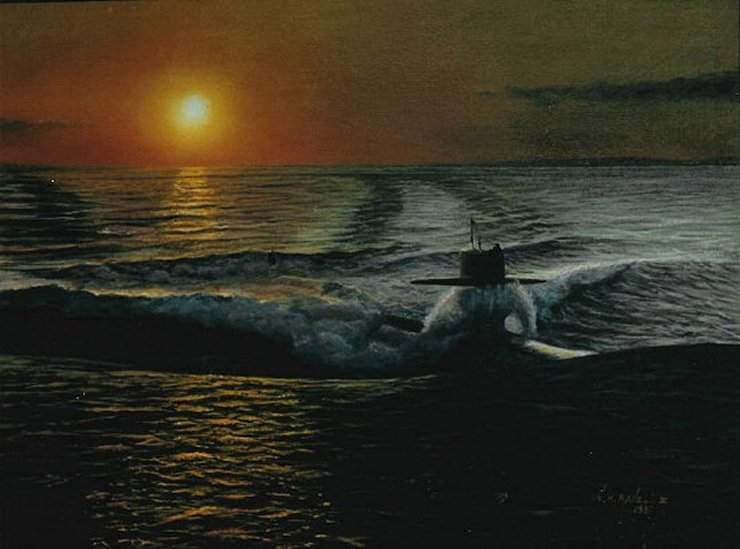 36k Acrylic on canvas by the artist William RaVell III depicting the Helena (SSN-725) during her shake down period off the New England coast, circa 1987. Photo courtesy of subart.net. 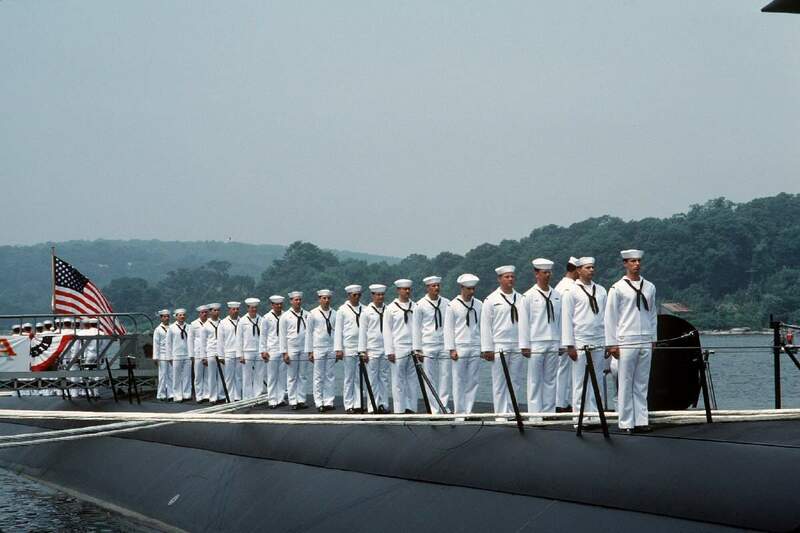 86k Crew members stand in formation on the deck of the nuclear-powered attack submarine Helena (SSN-725) during the boat's commissioning. Official USN photo # DN-ST-87-12475 by PH3 Joan M. Zopf, from the Department of Defense Still Media Collection, courtesy of dodmedia.osd.mil. 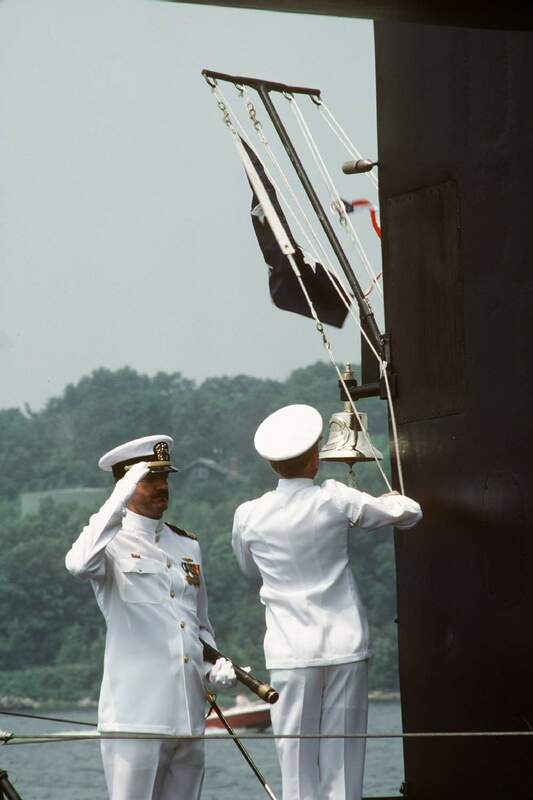 72k Sideboys salute as Admiral James Busey, commander in chief, Allied Forces Southern Europe, and commander in chief, US Naval Forces, Europe, escorts his wife Jean, boat's sponsor to the speakers platform during the commissioning of the nuclear-powered attack submarine Helena (SSN-725) . Official USN photo # DN-ST-87-12471 by PH3 Joan M. Zopf, from the Department of Defense Still Media Collection, courtesy of dodmedia.osd.mil. 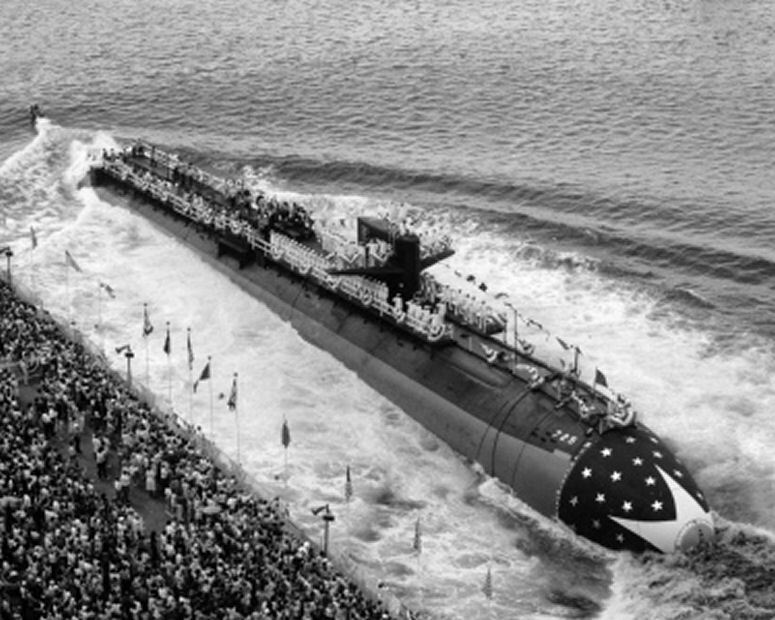 57k Guests listens as Admiral (ADM) James Busey, commander in chief, Allied Forces Southern Europe, and commander in chief, US Naval Forces, Europe, speaks during the commissioning ceremony of the nuclear-powered attack submarine Helena (SSN-725) on 11 Jul 1987. Official USN photo # DN-ST-87-12477, by PH3 Joan M. Zopf, from the Department of Defense Still Media Collection, courtesy of dodmedia.osd.mil. & submitted by Bill Gonyo. 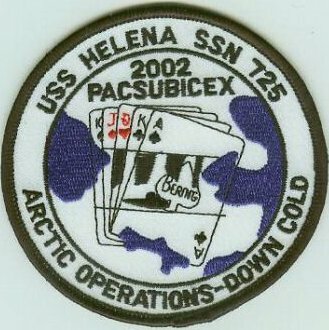 92k The commissioning pennant is raised aboard the nuclear-powered attack submarine Helena (SSN-725) . Official USN photo # DN-ST-87-12473 by PH3 Joan M. Zopf, from the Department of Defense Still Media Collection, courtesy of dodmedia.osd.mil. 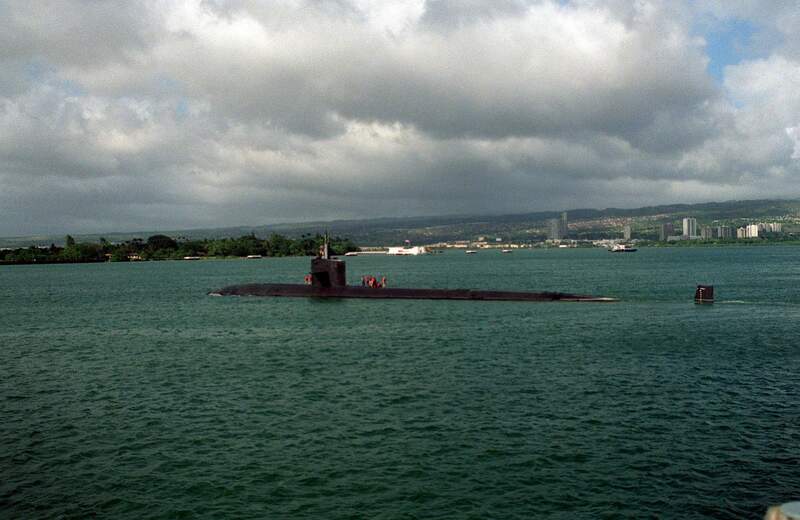 423k Crew members stand on the deck of the nuclear-powered attack submarine Helena (SSN-725) as the vessel departs from Pearl Harbor on 1 January 1989. The Arizona Memorial is in the background. 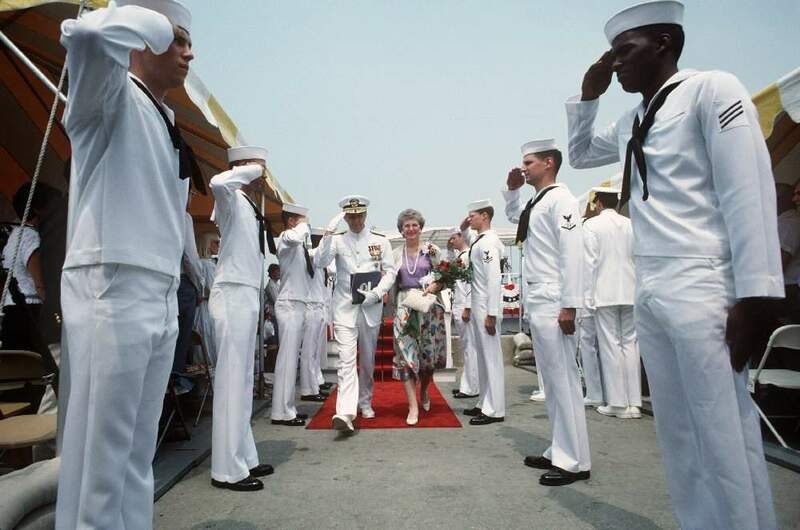 Official USN photo # DN-SC-92-05743, by OS2 John Bouvia, from the Department of Defense Still Media Collection, courtesy of dodmedia.osd.mil. 236k The nuclear-powered attack submarine Helena (SSN-725) passes the nuclear-powered aircraft carrier Abraham Lincoln (CVN-72) as the Lincoln heads out to sea for its pre-commissioning acceptance trials on 2 October 1989. Following the Helena is a Bell Model 206 Jet Ranger helicopter; hovering in the background is an SH-3H Sea King helicopter. Official USN photo # DN-SN-91-01141, by PH2 Dennis Dean Taylor, from the Department of Defense Still Media Collection, courtesy of dodmedia.osd.mil. 382k The nuclear-powered attack submarine Helena (SSN-725) and the aircraft carrier John F. Kennedy (CV-67) pass one another as the Helena heads into port at Naval Station, Norfolk, Virginia on 15 August 1990. 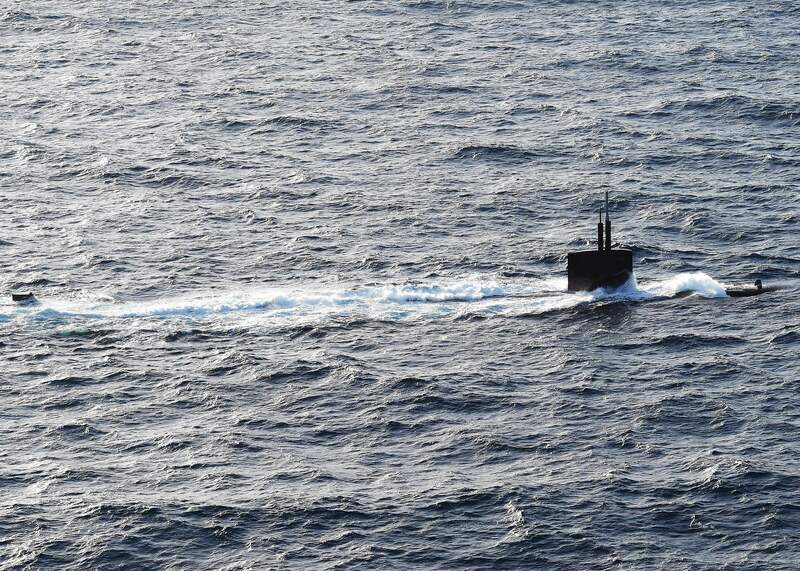 Official USN photo # DN-ST-91-05045, by LCDR Dave Parsons, from the Department of Defense Still Media Collection, courtesy of dodmedia.osd.mil. 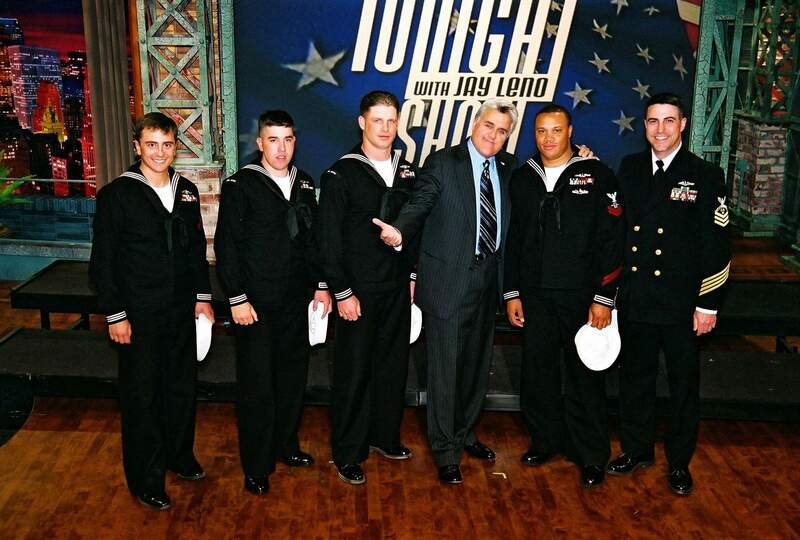 302k Five U.S. Navy submariners, assigned to the Los Angeles-class fast attack submarine Helena (SSN-725), pose for a photograph 23 November 2005 with "The Tonight Show" host, Jay Leno, during a special tribute to military members at Burbank, Calif. The special was taped November 23 and aired on Thanksgiving. 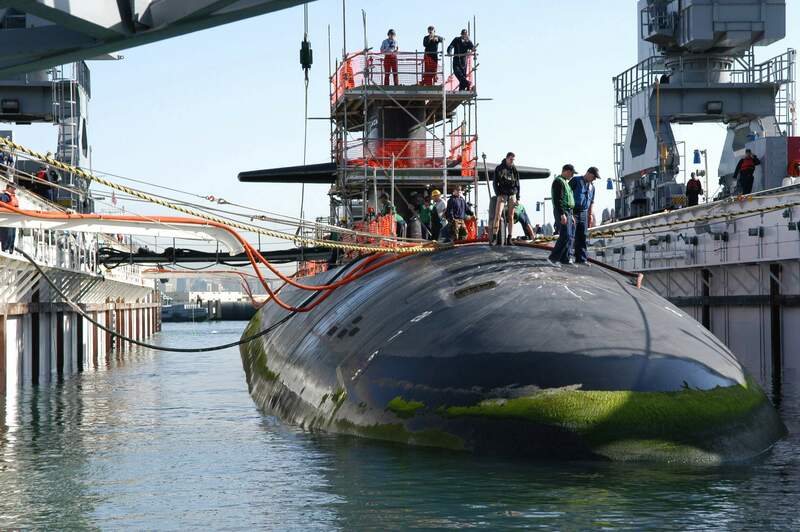 USN photo # N-0000X-001, courtesy of navy.news.mil. 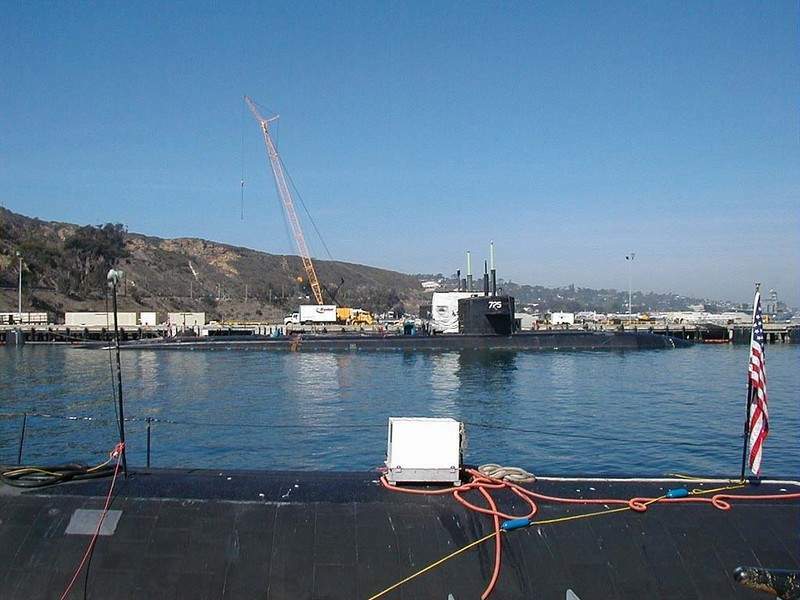 300k The crew of the Navy's only commissioned floating dry-dock, ARCO (ARDM-5), uses mooring lines to pull the Los Angeles-class fast attack submarine Helena (SSN-725) into the dry-dock at Naval Base Point Loma, Calif. 10 January 2006. 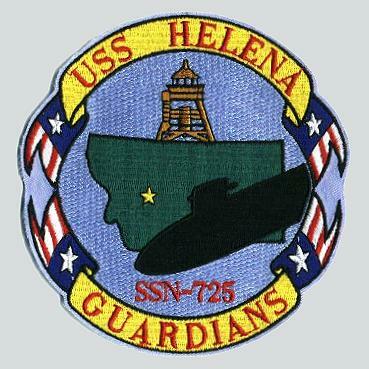 Helena is entering dry-dock for routine scheduled maintenance. USN photo # N-3532C-044, by Journalist Seaman Joseph Caballero, courtesy of navy.news.mil. 372k Marine algae adorns the bow of the Los Angeles-class fast attack submarine Helena (SSN-725) as she enters the floating dry-dock ARCO (ARDM-5). USN photo # N-3532C-092, by Journalist Seaman Joseph Caballero, courtesy of navy.news.mil. 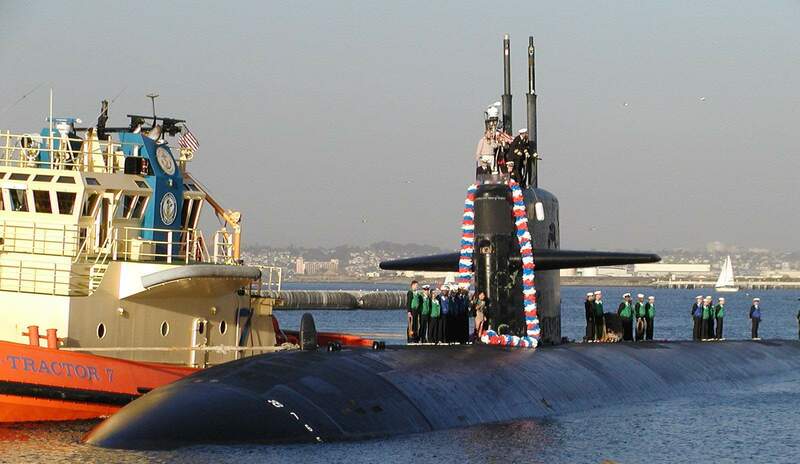 178k A 25ft safe boat escorts the Helena (SSN-725) out of San Diego Harbor on 26 October 2006. Official U.S. Coast Guard photo # DN-ST-87-12477, by PA3 Mary Larkin Jones, courtesy of cgvi.uscg.mil & submitted by Bill Gonyo. 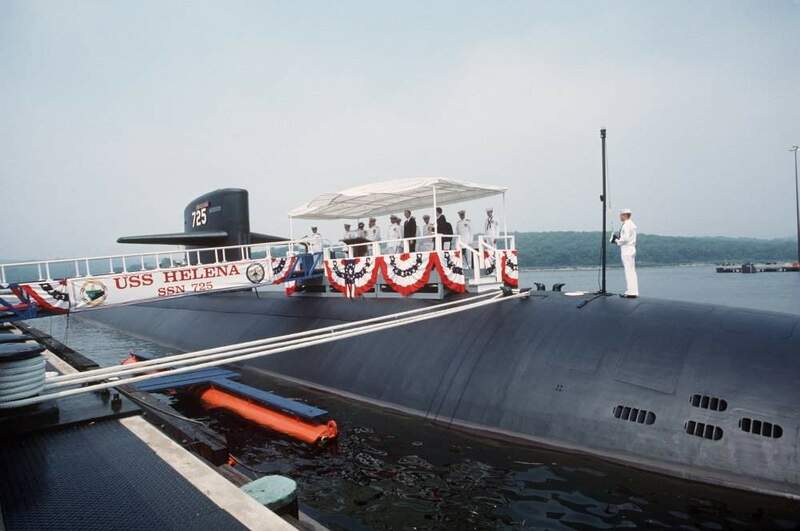 56k The Helena (SSN-725) is moored across from the Pasadena (SSN-752) in this undated photo. USN photo courtesy of wrongcrowd.com. & submitted by Bill Gonyo. 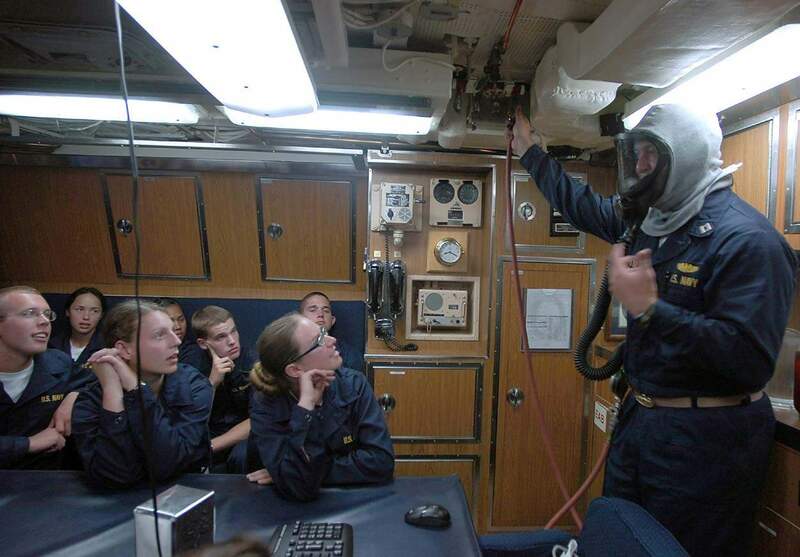 117k Midshipmen are instructed on the proper way to don an Emergency Air Breather (EAB) aboard the attack submarine Helena (SSN-725) on 27 July 2007. Twenty midshipmen from universities across the U.S. spent a day and night underway on Helena as part of their summer training to aid them in choosing a future naval career path. USN photo # N-4163T-139, Mass Communication Specialist 2nd Class Stephanie Tigner, courtesy of navy.news.mil. 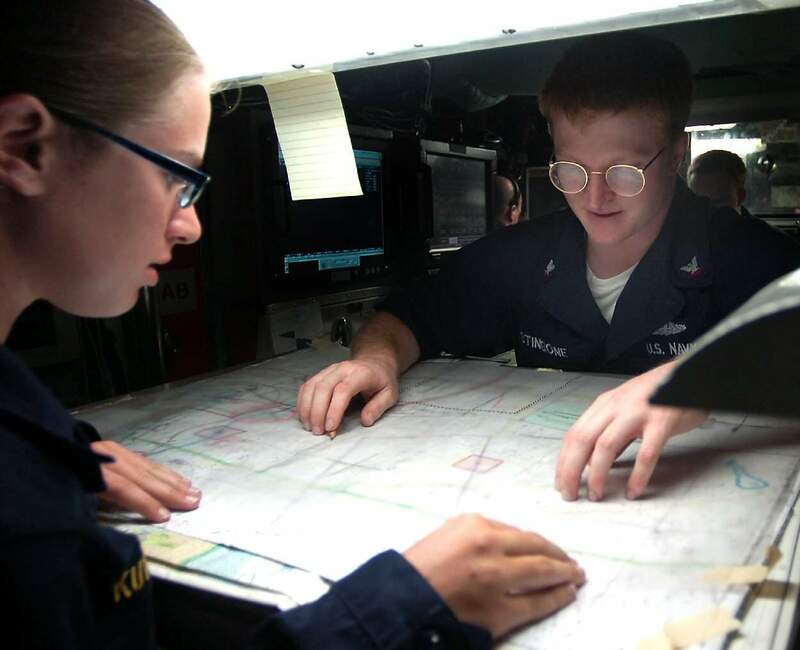 76k U.S. Navy Navigation Electronic Technician 3rd Class Christopher Stingone,of the Helena (SSN-725), describes to Midshipman 3rd Class Erynn Kutzera how he prepares navigational charts. USN photo # N-4163T-062, Mass Communication Specialist 2nd Class Stephanie Tigner, courtesy of navy.news.mil. 302k The nuclear-powered attack submarine Helena (SSN-725) and the San Antonio-class amphibious transport dock ship New Orleans (LPD-18) pass while conducting a submarine familiarization in the Pacific Ocean on 14 December 2007. The familiarization also included the Nimitz-class nuclear-powered aircraft carrier Ronald Reagan (CVN-76) and the ships of Destroyer Squadron (DESRON) 7. Ronald Reagan is underway conducting tailored ship's training availability. Official USN photo # N-0555B-096, by Mass Communication Specialist 2nd Class Christopher D. Blachly, & submitted by Bill Gonyo. 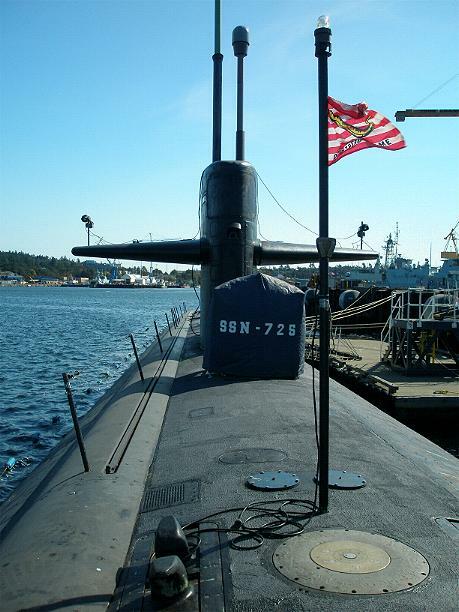 55k "Don't tread on me" flag adorns the deck of the Helena (SSN-725) in this undated photo. Official USN photo courtesy of usshelena.org & submitted by Bill Gonyo. 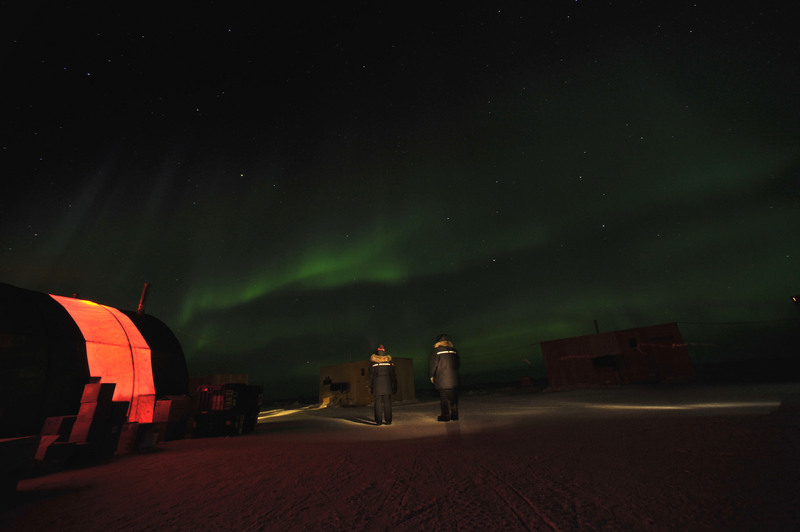 370k Personnel from the Applied Physics Lab Ice Station watch the aurora borealis light up the night sky over the camp in the Arctic Ocean on 21 March 2009. 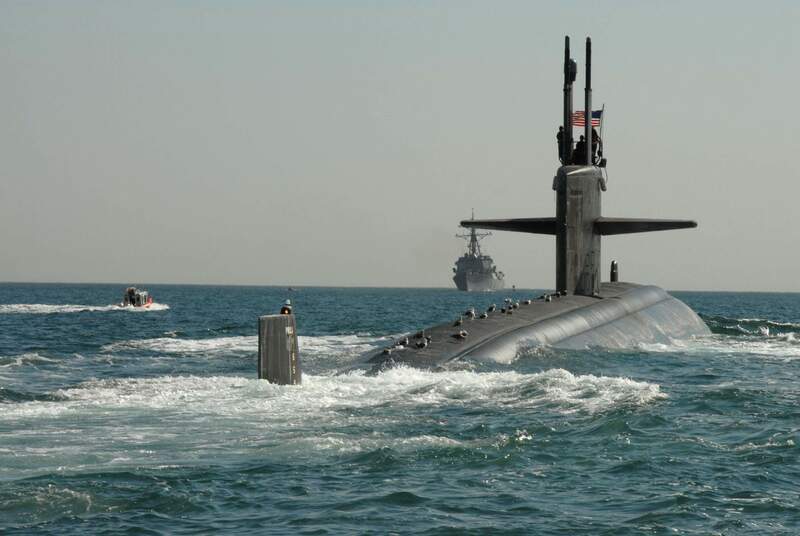 Two submarines, Helena (SSN-725) and Annapolis (SSN 760), will participate in the exercise with researchers from the University of Washington Applied Physics Laboratory and personnel from the Navy Arctic Submarine Laboratory. USN photo # 090321-N-8273J-011 by Mass Communication Specialist 1st Class Tiffini M. Jones courtesy of navy.news.mil. 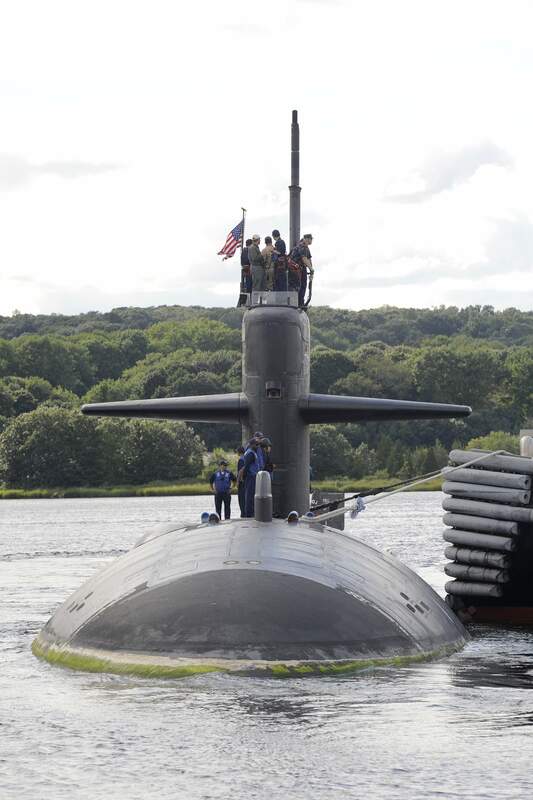 496k The Helena (SSN-725) gets underway from Submarine Base New London to Portsmouth Naval Shipyard in Kittery, Maine, 1 August 2009. 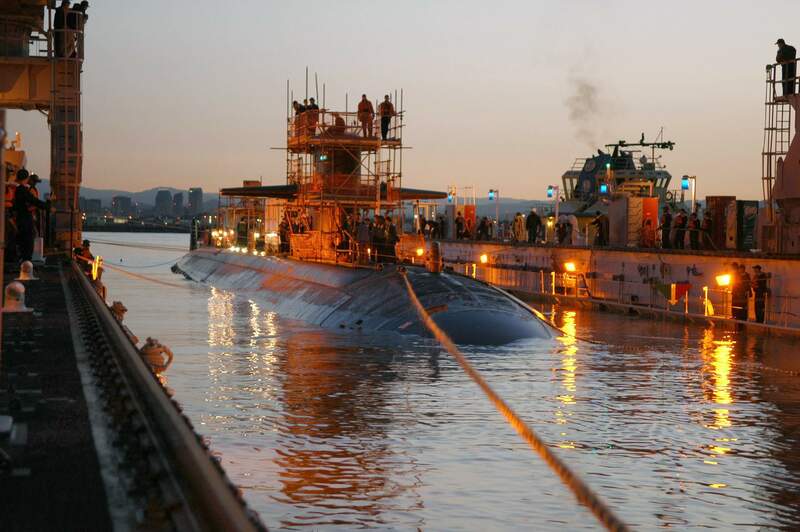 The submarine will be undergo extended maintenance, including several system upgrades over the next 18 months. USN photo # 090831-N-8467N-003 by John Narewski courtesy of navy.news.mil. 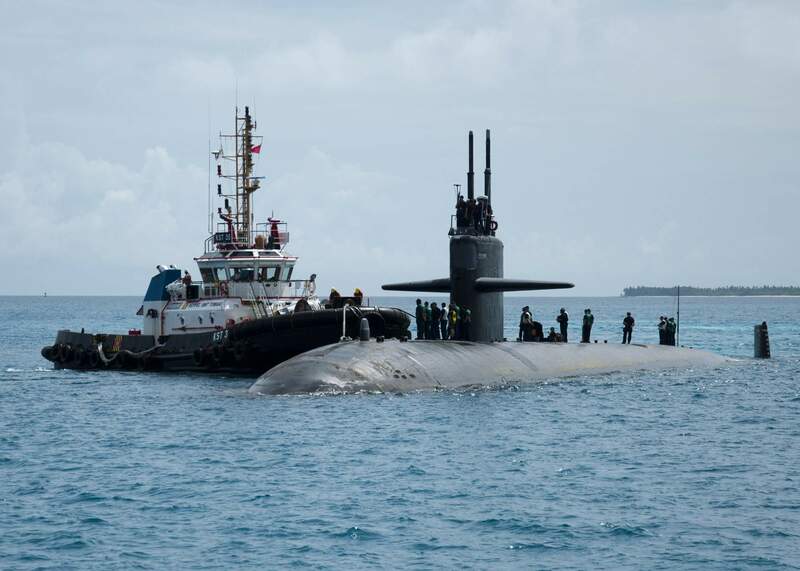 260k Sailors aboard the attack submarine Helena (SSN-725) prepare to pull into U.S. Navy Support Facility Diego Garcia for a liberty call and to replenish supplies on 4 September 2013. 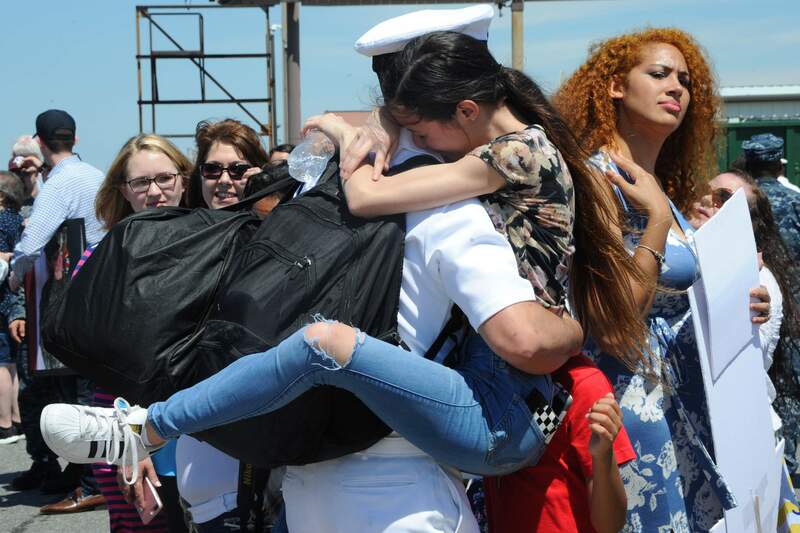 USN photo # 130904-N-ZZ999-030 by Mass Communication Specialist Seaman Cai courtesy of navy.news.mil. 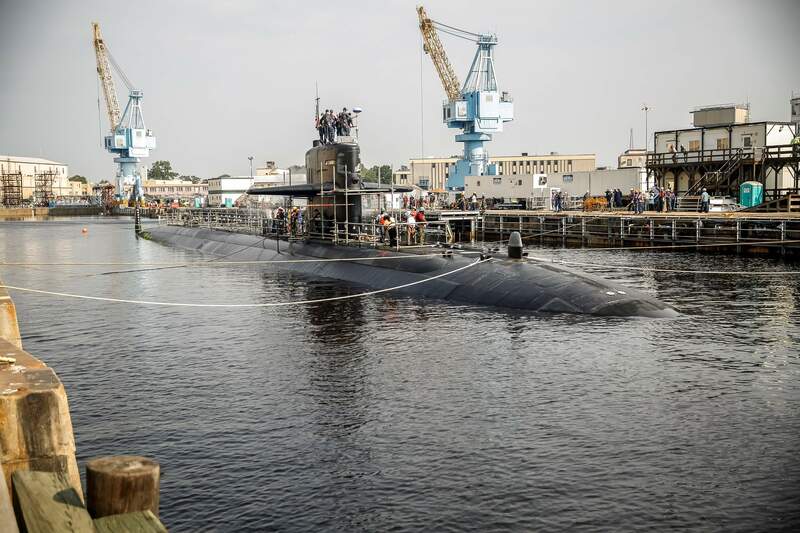 839k The Helena (SSN-725) arrives at Norfolk Naval Shipyard for a high-priority docking continuous maintenance availability on 20 August 2015. Helena will spend less than four months in the shipyard while workers complete the oil tank inspection and install technology upgrade. USN photo # 150820-N-MA158-001 by Shayne Hensley courtesy of navy.news.mil. 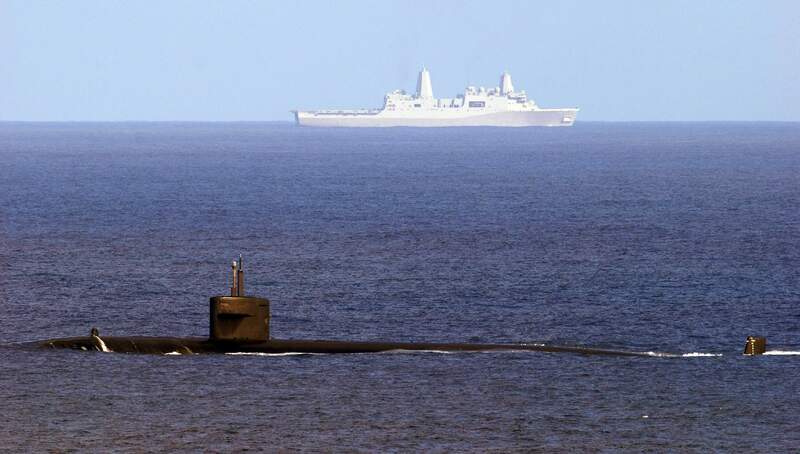 2.54k The Helena (SSN-725) transits the Atlantic Ocean with the Dwight D. Eisenhower (CVN 69), the flagship of the Eisenhower Carrier Strike Group on 24 March 2016. Ike is underway conducting a Composite Training Unit Exercise (COMPTUEX) with the Eisenhower Carrier Strike Group in preparation for a future deployment. USN photo # 160324-N-QY430-523 by Mass Communication Specialist 1st Class Rafael Martie courtesy of navy.news.mil. There is no DANFS History currently available for Helena (SSN-725) at the Haze Gray & Underway Web Site, the main archive for the DANFS Online Project.